The status of the Muslim Uyghur community in the region of East Turkestan in the west of China is a subject that has attracted considerable attention in western media in recent times. By contrast, it is fair to say that the issue is neglected in the Muslim world in comparison with, for example, the Israeli-Palestinian conflict, despite the fact that some of the reported practices in Chinese internment camps for Uyghurs are far worse than anything coming out of Israel and the Palestinian territories. There is comparative Muslim neglect of the Uyghurs of East Turkestan (aka Xinjiang) for multiple reasons. For instance, unlike the West (in particular Europe, the U.S. and by extension Israel), China has not been portrayed as a great historical adversary of the Muslim world. China also maintains extensive economic ties with many Muslim countries (in particular Pakistan) and runs an efficient system of Internet information censorship. China portrays itself as combating religious extremism among Uyghurs, and expresses particular concern about the Turkestan Islamic Party, whose amir Abd al-Haqq Turkestani has released a new audio message addressed to the 'ulama (scholars) of the Islamic Ummah and highlighting the plight of Uyghurs and the neglect of this plight by the Muslim world. 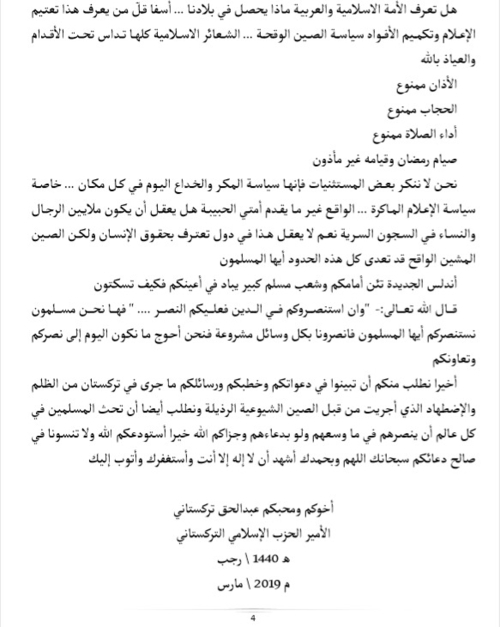 Although some might contest whether the Turkestan Islamic Party is 'jihadist' or 'Salafi jihadist', it is apparent from the release of this audio message that the Turkestan Islamic Party seeks to situate the Uyghur cause within a wider context of transnational jihadism. 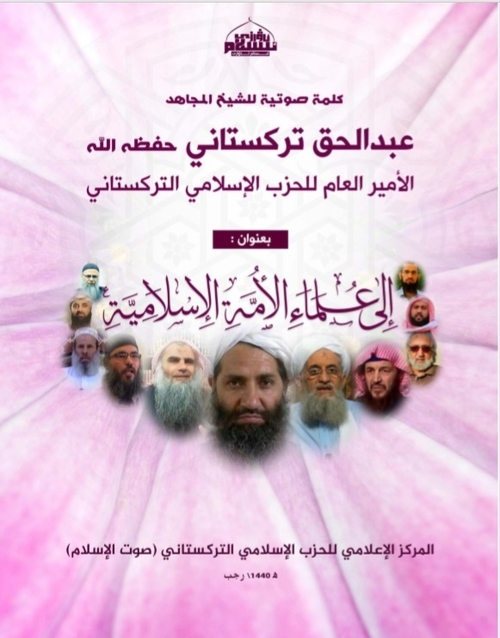 Looking at the cover of the transcript accompanying the message, one sees the faces of jihadist luminaries like al-Qa'ida leader Ayman al-Zawahiri, Abu Qatada al-Falastini and Abu Muhammad al-Maqdisi. For the Turkestan Islamic Party, then, these are the 'scholars' being addressed in this message. Besides this point, I would also note that anyone can read Turkestan Islamic Party literature and see that the group can be classified as jihadist rather than devoted to a 'geographically specific Islamist nationalism,' even as it is true that the group regards China as the main enemy to fight. Of particular interest in this audio message are the historical narratives invoked by Abd al-Haqq Turkestani, such as emphasizing the Islamic identity of the greater Turkestan region since the conquest of Qutayba bin Muslim al-Bahili in the early 8th century CE and highlighting the contributions of the greater Turkestan region to Islam (e.g. that the hadith compilers Imam al-Bukhari and al-Tirmidhi came from the region). In addition, he presents East Turkestan as the new Andalus. For context, Andalus was a region in southern Spain that had been under the rule of various Muslim empires and emirates until 1492 CE. The practice of Islam in the area was subsequently outlawed by the Spanish authorities, and the Muslim population either converted to Christianity or left Spain altogether, such that Andalus lost its Islamic identity. Finally, it is worth noting that this audio message has been enthusiastically distributed on the channels of Syrian jihadist group Hay'at Tahrir al-Sham, which has officially broken ties with al-Qa'ida but is a close ally of the Turkestan Islamic Party's branch in Syria. Below is my translation of the audio message. It pleases me to present you this address for the great eminence you have in our Hanif religion and our Ummah that believes you to be the heads of our crowns, for God- Exalted is He- did not place His noble book and His knowledges and sciences and authority in your hearts without meaning. Oh sirs of the Islamic Ummah, may God protect you and guide you. We are brothers to you in God from the land of Turkestan that many of the Muslims have forgotten. It is the land of the Muslims since the coming of Islam at the hands of the great conqueror Qutaiba bin Muslim al-Bahili (may God have mercy on him) and by his leadership in 96 AH. We are from a land of that Imam who composed the most correct book after the Book of God: Imam al-Bukhari and al-Tirmidhi, oh dear sirs. And the great Imams who offered highly distinguished services from our land are numerous and well-known and it is not boast. And indeed the point is that I am making clear to the distinguished ones of the Islamic Ummah our pains and hopes and how we have gone from top to bottom and I today mourn before you a people that is wiped out or almost so from the map of the Islamic world in a strange and suspicious silence and we do not find one who will take us by the hand and by God I am not exaggerating in these words of mine. The land of Turkestan has been occupied by the Communists for a whole century. West Turkestan has been occupied by the disbelievers of the Russians and East Turkestan has been occupied by the disbelievers of the Chinese. We today are more at a loss than the orphans in the banquet of the wicked: the criminal Chinese state has occupied the land of East Turkestan then called it 'Xinjiang': that is, the new land, and by this simple policy in the open it has succeeded in its natural deception. For example, we are neighbours of the Muslims of Pakistan and Afghanistan. But very regrettably few are those who know that there is a land called East Turkestan and exceptional is the one who knows that in this extensive vast land is a people called Uyghurs! And most of the Muslims, even the educated ones, call our land Xinjiang and call us Chinese. Woe unto a land that is being wiped out and in which corruption is great. Woe to a people the Muslims have forgotten and are said to be Chinese: we have our history, identity and culture, from the alaf to the ya' our culture, identity and history are Islam only and nothing besides it. And the Muslims today do not know our geographic position: we hate the criminal Chinese state and do not wish to be affiliated with it, and we never wish to be affiliated with it (God forbid that). Were America and Israel able to bring about its occupation upon Afghanistan and Palestine, would we call the Muslims who live in that land American Muslims or Israeli Muslims? No, by God, we will never be content with this affiliation for any Muslim- not for us and not for you: and we will not be content with the Israeli or American occupation, whatever it may be. The important point is that we are a part of the Ummah of Muhammad (SAWS) and we are an Islamic body and we cannot compromise on the Hakimiya [rule] of God Almighty and the sovereignty of the eminent guider Muhammad (SAWS) or our land and honour or our homeland and Muslim abodes. And disgraceful China has no sovereignty over us and our land and people. Whatever things come to, we are Muslims first and last and nothing else and there is no good in anything besides that. So fear God for us, oh dear sirs and Islamic thinkers and impartial journalists. And the heart may wound the heart of every Muslim when brought by the distinguished ones and 'ulama. So fear God for us, and do not abandon us in this crucial time, and do not look at us with cold hearts while we are being imprisoned, killed, subjugated and humiliated at the hands of the despicable and depraved Chinese, but rather raise your voices and sharpen your pens. We beg of you, oh distinguished ones, not to forget us in this dangerous time, for we are in a huge problem and great crisis. By God, East Turkestan is almost completely erased (God forbid). It has become today another Andalus calling on us in its weeping, cries and calls and screaming. So God is God, oh sirs and 'ulama. So fear God for us. Does the Islamic and Arab Ummah know what is happening in our lands? Regrettably, few are those who know this. The media black-out, the gagging of mouths, the insolent policy of China. The Islamic rituals are all being trampled under the feet, and refuge is to be sought in God. Carrying out prayers is forbidden. Fasting in Ramadan and undertaking it are not permitted. We do not deny some of the exceptions, for they are the policy of scheming and deception today in every place, especially the scheming policy of media. The reality is not what is presented, my beloved Ummah. Does it make sense that there are millions of men and women in secret prisons? Certainly, it does not make sense in states that acknowledge human rights, but disgraceful, insolent China has transgressed all these limits, oh Muslims. The new Andalus arrives before you and a great Muslim people is being wiped out before your eyes. How can you be silent? God Almighty has said: "And if they seek your support in religion, you must support them..." So we Muslims seek your help, oh Muslims. So support us by all legitimate means, for we are in most need today of your support and cooperation. Finally we ask you to make clear in your calls, sermons and messages what has happened in Turkestan from oppression and subjugation enacted by disgraceful Communist China. And we also ask that you incite Muslims in all the world to support them as far as they can even by their prayers. May God reward you best. I entrust you to God and do not forget us in the best of your prayers. Exalted are You oh God and by Your praise. I bear witness that there is no deity but You and I seek Your forgiveness and I repent to You. The amir of the Turkestan Islamic Party.